Where are we going? Chapter 9 presents the three step decision training model, shown to the right. 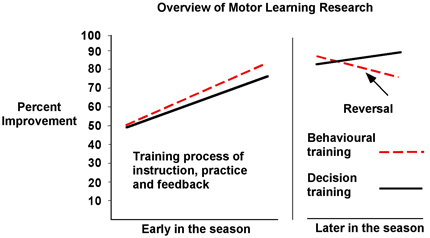 This model is based on the research shown thus far in the book, and also on modern motor learning research (see figure below) which shows that greater long-term gains are achieved when a Decision Training focus is used instead of traditional behavioural training. The decision training model has been used for many years, in all levels of sport, and has been shown to be effective. Read about the reversal effect in Chapter 9 as shown below.